Netherfield Residents Association has been going for over 35 years, we do Trips to the seaside, fun days, Parties and help the community get the best from our Estate, we have a history we want to share. Netherfield was one of the earliest completed rental housing grid squares in MK. It was built between 1972 – 1977, and is the second largest rental scheme in the city. The first houses were available in 1974 and by 1981 2,650 people had moved in making Netherfield the 4th largest new housing community in MK. And sculptors have created two special features which are still in the ABC park on Netherfield: The Owl & the Pussycat by Liz Leyh (1976) and the Totem Pole by Lesley Bonner (1979). The word Netherfield comes from an old field name recorded in 1781, and literally means “Land that is Low-Lying”, in the same way that Holland is known as the Netherlands, or Lowlands. “Langland” – A long piece of land. “Beadlemead” – The parish officer’s meadow. “Farmborough” – The manor-house farm. The amount of land which could be tilled with one plough in one year or was needed by one free family and its dependants. “Farthing Grove”- A quarter of an acre, or a quarter of a “Hide”. “Broadlands”- A wide spacious area of land. “ Buckland”- Fields where deer can be found. “Barnfield” – A Barley field. I moved to 280 langland rd netherfield in 1974, I was 7 years old, there was a shop in langland road, because farthing grove wasn’t yet built. I lived there until I grew up and had kids of my own. 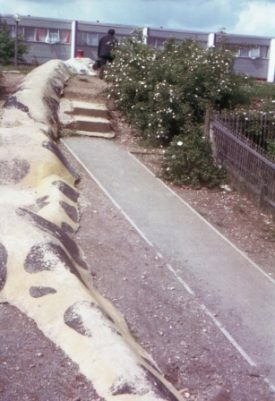 I help make the giraffe with bill billings and other various art projects around netherfield. It was a great place to live and explore..
It’s not a brontasauraus it’s a giraffe and I helped make it. I was one of the first residents of Netherfield and lived there before Langland Road was finished. I was 7 when I moved there and there was a shop in Langland Road for a little while as well. Can anyone tell me about the Brontosaurus shown in the picture. We are going to rebuild it but would like any information on it to help us. I can remember them going up. There was a shop on the Marlborough Street side where I used to pop in when I passed on my way to the building site that was to become the city centre. People who were moving in at Netherfield were delighted with their houses and loved being in the middle of open countryside (as it was then) with gardens and fields and trees all round.